Kelsier, Vin, Elend, Sazed, Spook, and the rest are now part of history-or religion. Yet even as science and technology are reaching new heights, the old magics of Allomancy and Feruchemy continue to play a role in this reborn world. Out in the frontier lands known as the Roughs, they are crucial tools for the brave men and women attempting to establish order and justice. Fun read. Serious audio technical flaws. Narrator alone is worth the purchase. 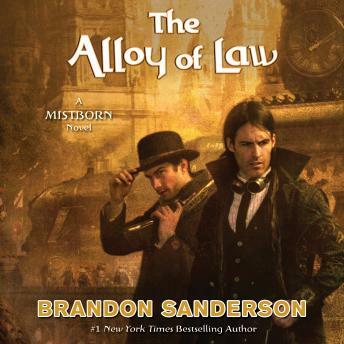 Keeping it short and fun, Sanderson doesn't engage in the world building and this leaves this sequel less satisfying and rich with ideas and philosophy than the first Mistborn books. I liked it, but didn't love it like the others. Still it's a fun read. It is a fun, quick book to listen to! The narration is spot on, and the character Wayne will keep you laughing, throughout the book. So great, it really is addicting. I can give the author so much praise but it would not be enough. Great book ! ! ! Very amusing and really hard to put down.